Creating a little romance in the coolest little capital doesn’t have to cost you an arm and a leg. There is a recipe to success and it includes food, a stellar location and setting the mood. 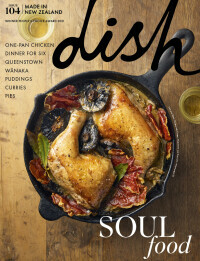 Dish Wellington writer Rhett Goodley-Hornblow shows us how to do it right come Wednesday night. No matter your budget, Wellington is a city for lovers. Valentine's Day is all about spending time with someone special and creating a special moment to share, just remember food, location and mood. Fish and chips is one meal that we know travels well, so pick your favourite spot in and around the city and place your order at your local fish and chip shop. If you’re in town, it's hard to go past The Chippery, this is a great option and only a quick walk from Oriental Parade. In terms of location, take your pick, there's the wharf, the golden sand beach or a park bench to share a quiet (see: romantic) moment. Once the sun has set, consider it time for a sweet treat. My suggestion? Head to Kaffee Eis. This delicious little gelato shop encourages taste-testing, so don't be shy about trying them all, it's important to find the flavour that your heart so desires. If the date is going well and the night still young, a quick walk or drive up to the Mt. Vic lookout is the perfect end to an evening, plus that view is pretty magical. Watching a movie is always a nice way to spend time together, plus it provides a great talking point for the rest of the night. Why not take your date-night to the next level and book in at Light House Cinema on Wigan Street (Just off Cuba Street). Light House is a cosy, old-school cinema that offers an impressive menu of fine wine, craft beer and sweet treats to enjoy with your other half – they even have double seats, so you can snuggle up and make yourself right at home. Before or after the film, enjoy a nightcap at one of the many bars within a stone's throw of the cinema. Head across the road on Wigan to Havana Bar, where they offer an extensive list of cocktails and a tapas-style menu, for something light to eat. Southern Cross is another great spot within walking distance. This funky garden bar has an outdoor fireplace to keep you cosy on colder evenings. The Cross has great small bites – just don’t get too comfortable before your movie or you might miss it. If you are after the 5-star luxury treatment, there are two restaurants in Wellington that will most certainly deliver on both the moment and the food. Logan Brown is one place in the city renowned for making all who visit feel grand, located in a beautiful old building on Cuba Street. The menu showcases some amazing New Zealand produce, presented with elegance and refinement. Take your time and enjoy a drink at the Rockpool Aquarium Bar, before or after your meal. See if you can spot the crayfish. For the romantics among us, it's hard to look past Ortega Fish Shack and Bar for a guaranteed a special experience. Located on Majoribanks Street in a converted Victorian villa, the team here have mastered the atmosphere, creating a unique shack experience with beautiful interior styling. It's widely agreed upon that the staff here truly the best, and will always make you feel like you are the most important person in the room – even with a full-house. When it comes to the menu offerings, seafood is the obvious choice at this fine establishment, but they have something for everyone if fish is not your thing. Here, you'll discover an extensive range of libations behind the bar, so make sure you take the sommelier's expert advice on what drinks you should order to best complement your meal. And if you're on the fence about dessert, my suggestion is grab a spoon and don’t hold back.